My big kids are at camp this week so I thought I would share a few summer camp care package ideas. I would love to tell you that I get these done weeks in advance but I'm usually up late the night before drop off finishing up their care packages! I'm always on the lookout for cheap finds but tend to leave the preparation till the very last minute (will I ever learn?!). 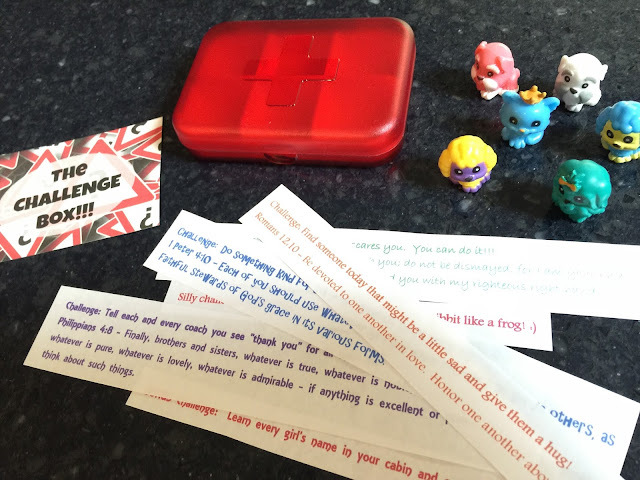 Here's a few things I did this year and keep reading for a list of 20 easy camp care package ideas! 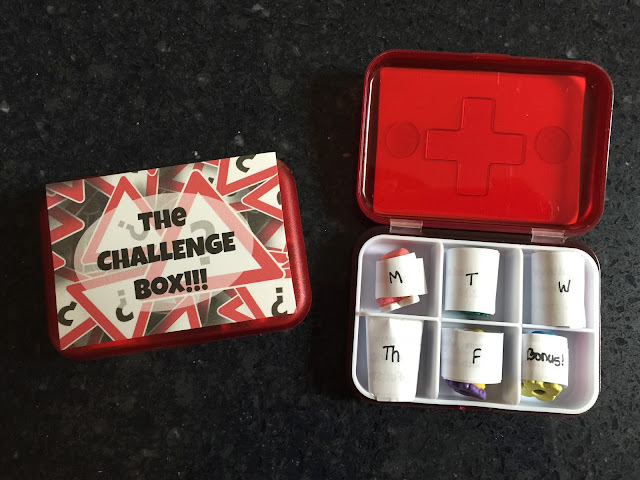 For the first day, I sent a little pill box with six openings. In each opening, I put a challenge for them (Holden and her BFF, Carly) to complete each day of camp. I wrapped the challenges around little Squinkies that I found in our playroom for a little something fun. Challenge: Find someone today that might be a little sad and give them a hug! Romans 12:10 - Be devoted to one another in love. Honor one another above yourselves. Challenge: Do something today that scares you. You can do it!!! Challenge: Do something kind for someone without them knowing. Challenge: Tell each and every coach you see "thank you" for all their hard work! Philippians 4:8 - Finally, brothers and sisters, whatever is true, whatever is noble, whatever is right, whatever is pure, whatever is lovely, whatever is admirable - if anything is excellent or praiseworthy - think about such things. BONUS Challenge: Learn every girl's name in your cabin and one really cool fact about her! I found these little pill boxes at Target's Dollar Spot. I found these awesome finds at Clare's this past summer - all for $1 each!!! For Wednesday's care package, I put together a little pedicure party in a box for their cabin! Holden loves all the little surprises but her absolute FAVORITE care package will always involve stuffed animals. I found this cute little gray fox (please tell me you think that's what this little animal is!) that actually is a pencil case (it has a little zippered compartment down it's back). I found this in the school supply section at Wal-Mart. More Target Dollar Spot finds for the last day! As the kiddos age and their tastes change, so have their camp care packages. Below are a few things I've sent over the years that have been favorites. 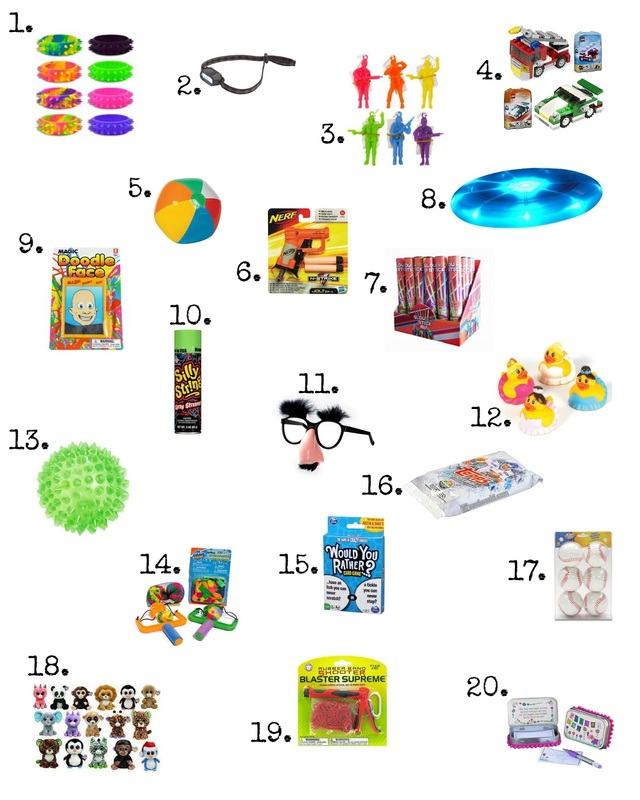 I hope you find a few that you can send to your favorite camper! 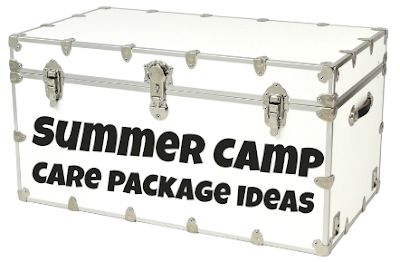 Do you have fun camp care package ideas? Please share!!! I'm always looking for new ideas! 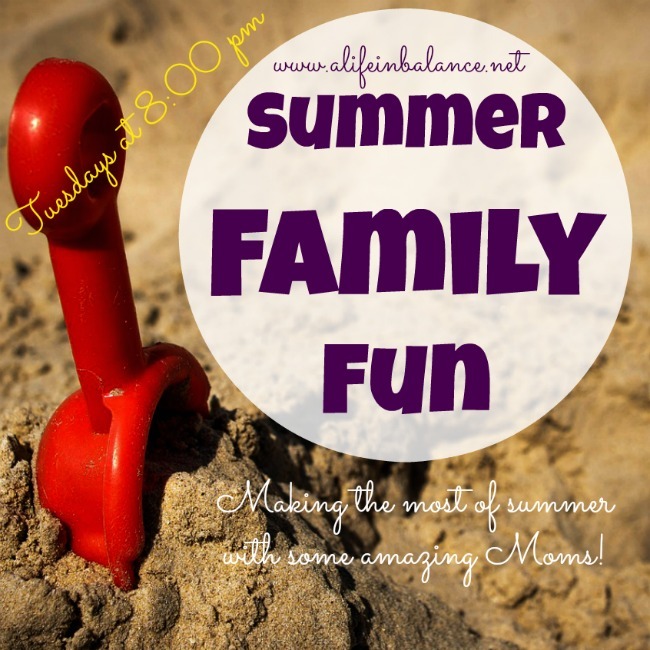 AND come back tonight at 8pm for #summerfamilyfun...for the next 5 weeks, you can find a BONUS link-up here for summer family fun posts! There are 30 co-hosts so your post will get maximum exposure!!! Feel free to link up both days! Holly, seriously, I want to be your kid! This is another great way to show your children how much you value them. Man, when I am stumped for ideas I am so going to contact you. LOVE, LOVE, LOVE this! You rock sister. Michelle, not gonna lie, it gets hard but it's seriously one of my love languages. I LOVE giving gifts! I'm always on the lookout for something/anything I think someone might like. It's fun when I can do a little word spin on it too! :) Thank you for your sweet words! Great ideas! It definitely gets harder to think of "cool" stuff for the care package as they get older! Lotion and lip balm/gloss is always a hit with teen girls. Lotion and lip balm!!! Fabulous ideas that I have never thought about!!! Thanks, Tanya!!! Those are great care package ideas. When Favorite Young Man went to college, I always kept him supplied with his favorite homemade cookies. You are seriously the coolest mama! I love all that you do for your kiddos! I think that little stuffed animal is a husky dog! LOL ....but lets pretend he's a fox! Have a fabulous week and enjoy your time with Hope! I am sure she misses her siblings but loves being the only kiddo at home! Thank you, Kim! I knock it out of the ball park some days and others I strike out repeatedly! :) But, I keep coming up to bag! ;) I am LOLing - now that you say it, it does look like a husky dog!!! Proof that I stay up way too late some nights and start seeing things! hahaha!!! Hope is having a fantastic time at Camp Spoil Me Rotten While the Bigs are Gone! Anytime I ask her something she says, "since I'm the only one here, do I get to choose?" Thanks for stopping by! Love the camp ideas! You're so creative. Also, the service challenges. I haven't been able to do any yet, due to money shortages, but I will try to do kind things for my neighbors. Be sure and check out this week's challenge! I've got a few ideas on how to serve for less than $1 (and some of them are absolutely free!). Thanks for stopping by! I hope you have a fantastic day! Oh I love these care packages! You are so creative! 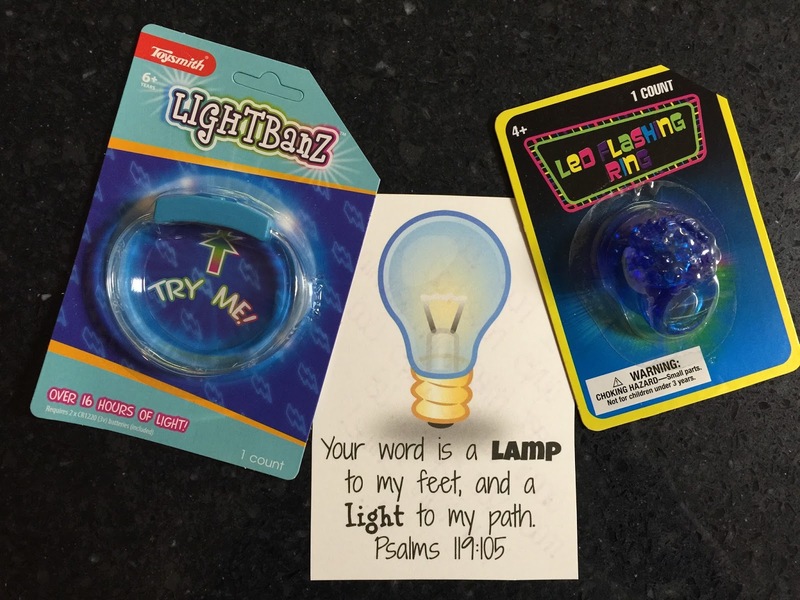 I love how you incorporated the bible verses for each task. Great job! God bless you always! You are one amazing Mom! Love these ideas! 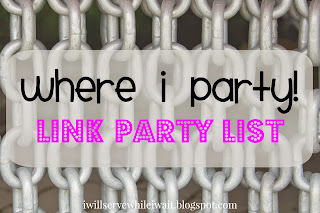 Thank you for sharing them with us at the Brag About It Link Party! Haha, Laurie! Definitely clips from my highlight reel - there are tons of bloopers and clips that don't make the cut! ;) Thanks for stopping by! Have a great evening! Love that pencil case fox :) I would get that for Sophie if I found it here. And you're more than welcome to send me a care package anytime ;) I would love to have any of those gifts. Thanks! It's super soft too! These are awesome! I think if Xavier ever goes away to camp I will be calling on you for a care package! lol! I love this! You are such an awesome Mommy. I hope I do these things when my kids are camp age. :) Great ideas. Came over on SHINE today and found your post next to mine. Thank you, Melanie! This is the type of stuff I really enjoy so it's easy! I'm glad you stopped by! Have a super weekend! These are excellent ideas. I'm going to use them to send packages to my grandkids who do not live close by. Thanks for sharing at my Grandma Ideas Sharing Time link party. I really appreciate your participation! Thanks, Nina! I'm glad you could get some ideas! 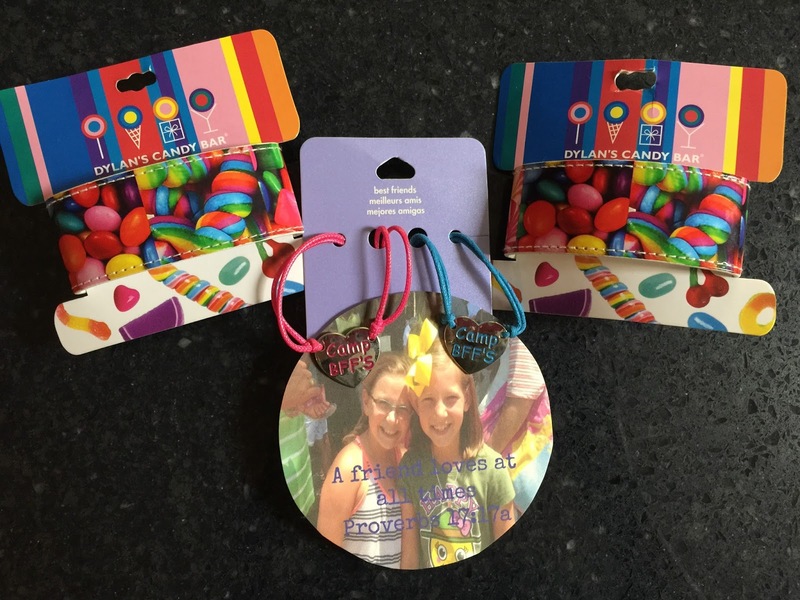 I know your grands will love them! So, I know you did this a year ago, but I just now found it! This is exactly what I was looking for. I am surprised this type of stuff isn't just oozing out of Pinterest! You are brilliant! I am so glad to have found your blog. It's bookmarked now! I'm so glad you found it!!! Thank you so much for your sweet comment! Glad I could help!